CarWale app is one of the top rated car apps in India for new and used car research. Today, finding a suitable car for your needs can be exhausting with a multitude of options available. CarWale app, answers all your car related queries online. At CarWale, we work towards simplifying your car buying journey by providing accurate on road prices of cars, genuine user and expert reviews, option to book test drives with nearest dealers. 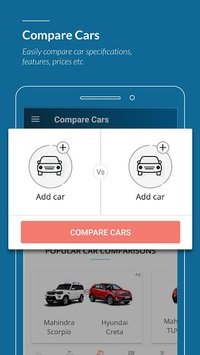 You can also compare different cars with the car comparison tool. 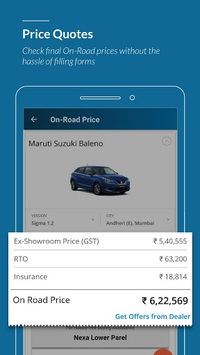 This app also helps you to connect with your nearest car dealers for the best offers available. If you are looking to buy second hand cars, this app provides more than 50,000 verified used car listings from genuine sellers. You can also sell your second hand car in just a few steps and know the right price for your car with the car valuation tool. 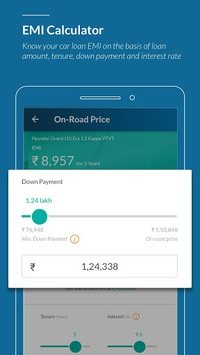 • On road car price – Get accurate and up to date ex-showroom, on road price and price breakups for all cars sold in India of brands such as Maruti Suzuki, Ford, Honda, Hyundai, Renault, Tata, Toyota, Mahindra, Nissan, Datsun, Audi, Mercedes-Benz, BMW and so on. • Car News - Latest domestic and international car news including a special section for upcoming cars in India. Stay updated with all the latest events in the Automobile Industry in India such as Auto Expo 2018 and Track Day 2018. CarWale Android App is the most downloaded and top rated app in India. Download now, and experience the new way of doing car research.